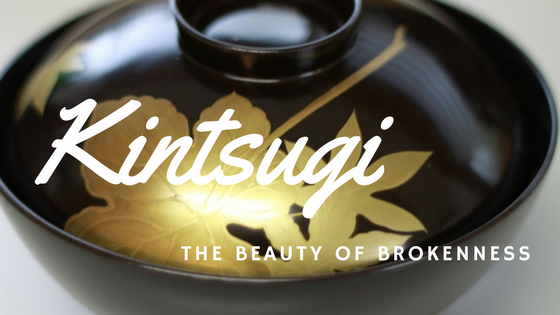 Kintsugi is a Japanese art of repairing broken pottery with a special lacquer dusted with powdered gold. Instead of attempting to hide brokenness, the lines are actually accentuated with gold celebrating the pottery’s history. The uniquely fashioned seams glint with gold, bringing beauty from brokenness. even a Christmas tree topper. None of them compare to the beautiful pieces of kintsugi; nonetheless, they are precious even in their brokenness. I have come to realize lately that God is exposing and actually accentuating my brokenness. He is “kintsuging” me! I would much prefer that my brokenness remain concealed, masked or hidden from public scrutiny. As a matter of fact, I try my best to do just that. I’m not alone! The cosmetic industry tops $62 billion annually – that is a lot of concealing imperfections and finding new beauty. God recognizes beauty in us, just as we are. It isn’t just women who struggle to grasp this God perspective, we all do. Kintsugi recognizes breakage is part of the history of any object. How do we value and even embrace the beauty while living in the pain of brokenness? Brokenness can seriously limit our ability to freely choose and presently live to our fullest potential. Pain has the ability to densely cloud our perception of personal identity, worth and purpose. I can personally testify how the gold of God’s truth can infuse even the most crushing moments and reveal His design and glory in the midst of overbearing tragedy or loss. The psalms simply say “He sent his word, and healed them and snatching them from the door of death.” The truth of God’s word gently breathes life back into our shattered pieces. His truth sets us free to see brokenness from a higher and eternal vantage point. At one time I had many delicate and beautiful ornaments; many were gifts. Then we had five sons! Few of these delicate pieces survived! I wish I would have known about kintsugi then. Brokenness may scar us, but it will never diminish our value! As a matter of fact, after the Master Artist remakes us, we hold even greater distinction! In Kintsugi, scars actually become the most valuable and beautiful part of the whole. I honour those who bear their scars well. Scars are the solid evidence of survival and over coming difficulties. They form the beautiful marks of an enduring life! That Jesus would maintain His scars after the resurrection is a marvel to me. He didn’t need to! He chose to! “Put your finger here; see my hands. The scars Jesus bears continue to prove His identity. Scars identify us too! They prove God’s faithfulness to heal and restore our brokenness. Scars are the marks of our personal journey between birth and death. They are the road map of experiences we have lived through, conquered and overcome leaving us better than before. In Guatemala, a man who had been healed of extremely large stomach cancers revealed his deep scars with pride. They were evidence to Christ’s healing power in his life. The physicians said, “You will die!” Christ spoke the contrary, “You will surely live!” Live is what this man was doing years later! Sometimes in Kintsugi, a brand new piece is graphed in. Sometimes Kintsugi is two individual pieces graphed together. They actually create a brand new form, quite different from the original – a delicate and unique work of art. God has specifically designed each of us to bear both similarities and differences to every other person. Kinsugi reminds me of this truth. These new lives bear no resemblance to the old! When hope shatters against the cruel pavement of life, beauty seems impossible to visualize. Impossible that is until The Master, takes each broken piece in His gentle hands and creates a new and beautiful masterpiece. and I saw him working at the wheel. No matter how marred and broken, God reforms, reshapes and repurposes our lives. As a matter of fact, when He is finished the result appears so perfect, we wonder if this wasn’t His “Plan A” all along. God is never the one who breaks or harms us. We have an enemy who is bent on stealing, killing and destroying any worth or value we possess. God is THE Ultimate Restorer! So the next time we meet, ask, and I just might let you see my scars. ← 3 Godly Characteristics – Justice, Mercy and Humility! Great post, MaryAnn! Thank you for sharing and touching my soul. Great article MaryAnn! Very touching! I’m going to be sharing this with some of my customers! We need to love and appreciate what God created us to be – including our face!! And I agree that way too often we women (and many men too) get hung up on trying to conceal and erase what I call “experience lines and spots” that we’ve “earned the right to”. But then again Makeup is not near as costly as gold to fill those cracks! (Ha Ha!!) And it leaves my skin glowing too! I like that “experience lines”!